Sam and Richard welcome Wojciech Narębski to #ProjectKazimierz. At 89 years old, Wojciech has seen and experienced things that we rarely get a firsthand look at anymore. From soldier to Soviet prisoner, to college professor, his lifetime of experience makes him uniquely qualified to offer some very thought-provoking insights. Hello again, Project Kazimierz Podcast Listener, this is Sam Cook, co-host of Project Kazimierz with my co-host here, Richard Lucas, and we have a very special guest today, that I’m going to let Richard introduce because he’s probably better qualified than anyone to introduce our guest, Wojciech Narębski. And were sitting in – really as a former history professor, absolute dream location right now – which is an old communist era flat in the middle of Krakow, Poland with a war veteran here from the Second World War that I can’t wait to introduce you to, so I’m going to pass it over to Richard here and do a quick introduction so we can start talking to Wojciech. Ok, yes I’ve invited myself and Sam here to the flat of Professor Wojciech Narębski.Wojciech’s been a friend of mine for a number of years and we worked together to raise money and awareness of Wojtek the Soldier Bear, but that’s through and now I regard Wojtek as a good friend and we’re here partly to discuss the TedX Kazimierz Project but also to give listeners to the podcast a chance to meet Wojtek. So without any further ado and with great admiration for Wojtek, who’s eighty nine years old, could you just introduce yourself to our listeners? Well you know I joined the Polish army In Soviet Union after… because I was only sixteen years old, I was arrested in Vilno, now capital of Lithuania, hence evacuated to Soviet Union and after the Germans attacked the Soviet Union, from enemies we became allies – not friends, but allies. Yes, of the Russians and the Russian communist authorities where liberating us and allowed under the control of Great Britain, really after Churchill was present during the signing of the treaty between Sikorsky, our commander in chief in London, and the Soviet ambassador in London, Mayski, therefore called the Sikorsky-Maisky treaty. The consequence of this treaty was the formation of the Polish army in the Soviet Union. And I joined this army in the autumn of 41 because I was …in April. I was half a year in prison and after words, I joined the Polish army. So you were still sixteen? You were sixteen years? Sixteen still because I was born on 1925, in April … but at once I went to hospital because you know the young organism didn’t support well such very difficult conditions and battled food, battled vitamins you know… and therefore I was twice and first I was in Soviet Union in Buzuluk… I was in hospital afterwards my troops, from Uzbekistan we were transported, we bust through the Caspian sea to the Middle East and then was formed first the Polish army in the Middle East, and from this army after the second evacuation of other groups and some civilian people, too, from Soviet Union to middle east was from the Polish Second Corps. Some people are living still, you know, because they were very young. Yes and I think I saw a stamp, I have a photograph I can post it in the show notes, a link to a stamp made by the Polish post office for Isfahan, the city for Polish children. And I think it’s very nice that these memories are kept alive by people such as yourself because we’re very internationalist people the Wojtek Project we work on, brings people from all over the world, in particular with so much hostility between different countries. It’s nice to remember that the level of people who are very good relations between the Poles and the Iranians back in the 1940s. Yes, you’re right. So since I was in the first migration that was at the end of March in 1942, you know. And we all.. the civilians were directed to Iran at the invitation of the shah. And the soldiers, like me, to Palestine. And Palestine was for the First Polish Division, the Third Carpathian Division, which was found from the Carpathian Brigade, which returned just from the Libyan campaign against Rommel you know. The defense of Tobruk, famous, together with some Australian soldiers because you know there were British, Australian and Polish soldiers. And it’s interesting in the British Second World War mythology there’s often the expression “Britain fought alone,” and he’s someone who knows a little bit about British history, it’s a kind of nonsense. There were people from all over the world, from British India, from Australia, New Zealand, from India, from Poland, from Czech Republic, from Canada, from America, fighting together with the British, we weren’t really fighting alone. It was very good we were fighting of course, it was right to be fighting against the Nazis. And also South Africans, you know. So are there any particular memories of your time in Middle East that you’d like to share? We have a common memory, of course. Well, not a common memory, but memory I know very well. But [for] the people who don’t know the story, could you in a few sentences tell the story? You know what was very nice, very sympathetic for us that in that time, in Palestine half of the Jewish population was of Polish origin, from Poland. And therefore we could speak everywhere in Polish, you know, there was restaurants, even Polish vodka introduced, you know, and for example I was so happy that I entered Palestine through the Jordan river, you know. And we kept seeing the first kibbutz, soviet, the agricultural organization, you know, agricultural farms, you know. And when the people were looking at us and we had the Polish eagle on the caps you know. “Boys come on, come on, look, our boys are coming, long live Poland,” you know, you were so … welcome in Palestine. So it was for us a surprise really but very nice surprise. You know it was there, we had fruits because all the people were, the majority was ill, you know, still had problems with stomach, with avitaminose, and so on, you know. And there with oranges, bananas, all the fruits you know because you know really, Palestine is a paradise of Middle East, you know. The Jews are very good organizers and very good agricultures and they were cultivating all the possible, … fruits, not only fruits. Of course because you were a prisoner in the Soviet Union, you had suffered very much but did you have the sense that the ordinary Soviet people had a better life than the prisoners were, cause conditions were pretty bad to everyone in the Soviet Union. You know I can say that the Russian people [were rather friendly] toward us, you know, because they were suffering similarly from those terrible communist authorities. You have this saying in Soviet Union: “Who was not in prison is not a man.” So, I’m joking, of course, but since I was in Soviet prison a couple years I have attained my humanity. I am man, I can call myself a man. Yes and one of the reasons I am so honored to be able to do this interview is that I think that it’s very inspiring that you can smile and remember and still be calm and happy and have a positive… find anything positive because I think for many people, these experiences could be so terrible, that they might imagine they could never smile again. And having had such a terrible thing happen in your childhood because I suppose when you were ten years old, you couldn’t possibly imagine that in seven years time you could be deported via Kazakhstan to the Middle East, it would just be unimaginable.And then the second question which is are you actually going to do anything? So I have young West German friends, they are not young anymore, but when I was young and they were young and indeed when Richard was young – he’s even younger than us – they would go off for the Wiedergutmachung, the reparation work where they would go and work in the old people’s homes in Israel doing very menial sort of jobs but just to show that as a young German they realize that the shadow of the Holocaust still hung over their country and they just wanted to do their bit so they could feel they have done something and my ex-wife’s mother, my ex-mother-in-law as soon as the war came down in East Germany they just very quietly went off and tidied up the Jewish cemetery which had been allowed to fall state of terrible disrepair in their hometown of Gota and again that was a very important thing and they were able to find people from Gota , Jews from Gota who had fled before the Holocaust who were living in Israel and were able to come back and that rather sort of more than just symbolically was sort of healing the wounds between the German Germans and Jews of German extraction. So I think there are things you can do but I think it’s a very chewy subject and I shall be happy to try and talk about it at some of the Kazimierz TEDx. No…And at that point, we arrived in Palestine I was first in the Third Carpathian Division because it was the only unit which was first formed. But afterwards I said before already that the medical commission decided to lower my [military fitness] category of life. “My dear boy, with such health you have, you cannot be in the infantry.” And I was directed to the transport company. Of course. And not everyone listening to this and to you will know the history of the bear. 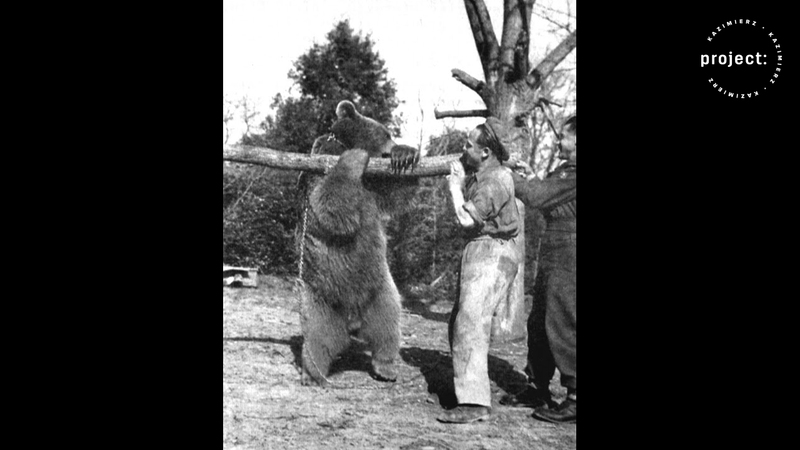 So could you say in a few sentences just introduce Wojtek the bear to people who don’t know his story, cause not everyone listening to this does know the story of the bear. Yes, you know, and since I joined… Wojtek arrived in our company exactly on 22 August 1942, you know, and I was in the company two months later and therefore I didn’t know the first period of his life. And unfortunately, the first books about Wojtek were presenting a false history of his younger age, you know, the first period of life. Because these first like… Wojtek from Monte Cassino, was the first book by Lasocki, and he didn’t know that our company was formed in April. 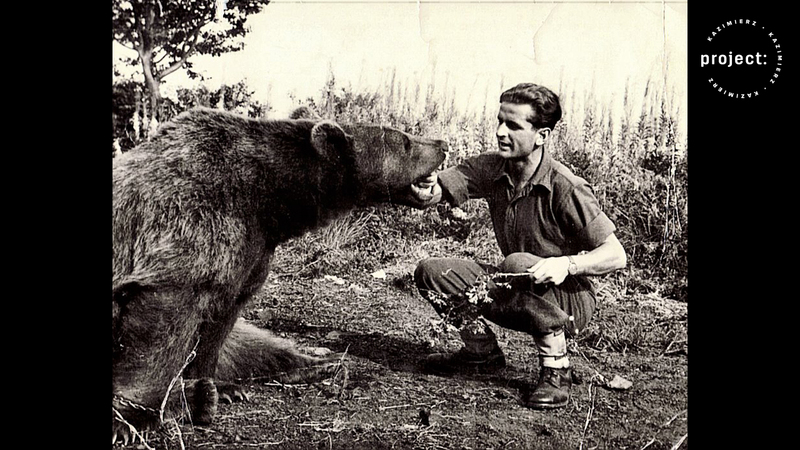 He [Wojtek] was found not by soldiers of our company, which didn’t exist yet. but by a group of civilian Polish people, just then invited to Teheran, to Persia, to Iran. And the first three months… So we know it now, you know, because since five years… about after the film about Wojtek… The Bear for Beer. 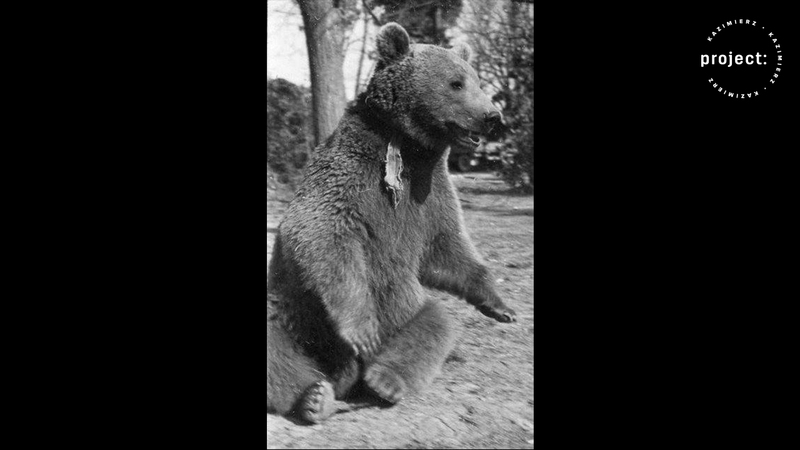 Beer for the Bear, yes, by Maria Dłużewska, and it was her merit, you know, the author of this film, a very good film, that she found the first owner Irena Bokiewicz, who was living in London, with [her husband]. And he confirmed it. I was in London at the first presentation, the premiere of the film, of English film made by… who, do you know? 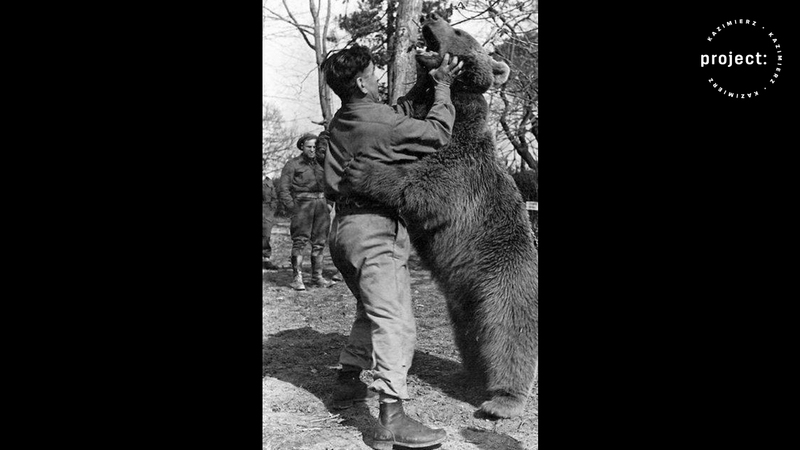 Wojtek, the Bear that Went to War. Yes, That’s by Animal Monday. Brother, Edward Lucas who we’ve also interviewed for this series as well. So… and there are a couple of famous images. There’s an image of the bear carrying an artillery shell but that’s not exactly what happened. Can you describe what you saw? Yes with a collar and somebody was keeping, you know, this chain. You know. But you did see him carrying not just one shell, but whole boxes of shells, is that correct? Yes, he was helping us, but not close to the artillery positions, but at the base, where the stores of munition were. In Venafro, it was about twelve kilometers from Monte Cassino, you know …and he was helping us in putting the boxes, there was four shells, in each box, to put it on the lorry, you know. So he was loading the lorry. And each shell weighed twenty or twenty five kilograms? Oh yes it was… no, I will not say … in pounds, it weighed about two hundred pounds, you know such a box. So that would be about 90 kilograms maybe. Yes, yes, yes. You know usually an animal likes to do the same, to copy his owner. His Polish friend. 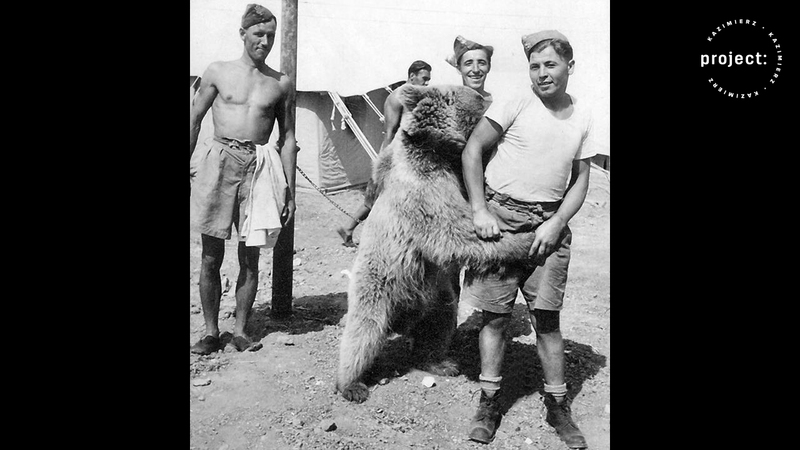 And when Wojtek has seen, that we were, with great difficulty, you know, in fours, often [carrying the boxes]. He approached, you know, and… He was already quite strong, it was 1944, so he was about 2. So it was for us very easy, you know if it was not from the soil you know from the ground, but just, it was higher. he was really helping us. And I think another story I think you told was about when he was swimming and he swam out to the sea on the beach. Didn’t he like to go swimming and frighten some people of some stage? …and we were carrying our task was to liberate Ancona because it’s a great port and the 5th American Army, which was fighting along the Tyrrhenian sea, you know, had to liberate Livorno, another port on the other side of this peninsula, the Apennine peninsula. There since we were divided from other corps of the 8th British army, cause we were within the 8th British Army, you know. Cause these two armies were the 8th British and 5th American. And always was going on the right side along the peninsula. And Americans on the left side you know. So sometimes we were meeting, even, and there was a lot of Poles, you know, of Polish origin, so they often visited us, you know, and were speaking Polish still. And Wojtek went swimming, yes? Ah! I returned to the Adriatic coast. Since the road, this Via Adriatica was going about fifty meters from the coast, you know. It was in June, July this period. 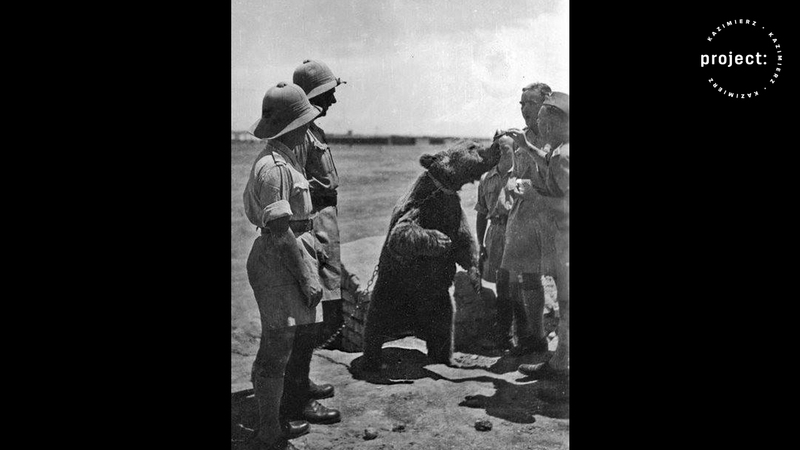 So it was really hot, you know, and for Wojtek … [Polish: “how do you say you fur?”]. So a bear comes out. Yes, and we’re actually recording this in 2015 and I remember I think it was three years ago in April we flew to Imola and were in the Krakow airport on the, I think on the 14th of April, which is your birthday and we meet a group of Italian children and we sang you happy birthday and they were very happy to meet you cause they heard your stories. That’s right, a regular flight, we flew, we visited Dorota Kulakowiak and it was the anniversary and also meets the young soldier Henry. I remember we meet a British retired soldier Henri Strzelecki, who after the war created a very famous clothing brand, the Henri Lloyd’s sports clothing brand. He died and I was very disappointed but I felt that because he was a very rich man. I thought that I could have asked him to give some money for the statue project. But I failed to think of it, and then years later I wrote to his children. But you know Imola is planning to… build the monument of Wojtek. I can show you I have even the… plan. I’d love to see it but we’re just recording this is not a video, after the recording. After the recording. And they want me to inaugurate, you know, this monument. You couldn’t be there for the unveiling of the Krakow statue that we jointly are responsible for because you were actually in Monte Cassino. I was just in Monte Cassino. Just this year. And one of the reasons I would love if you agreed to have you the TedX Kazimierz stage is because the slogan of our conference is “Age is no limit.” And the idea that someone who is now 89 a couple of years ago was flying Italy, and is planning a trip to Italy to unveil a statue is, I think, very inspiring for everyone. And maybe one of the questions that people might ask is, many Polish soldiers didn’t return to Poland after the Second World War and but you were in the UK, I’m not sure for how long, at the end of the war, how long did you stay in the UK and when did you decide to go back to Poland and why? You know first I wanted to remain in Great Britain but I was attending the Mining and Technical College in Barnsley, near Leeds, you know and Professor Reeve, who was [the] dean of the chemistry department, told me that he, “If you will remain in British Isles” and will, I don’t know how it is in English. Support you, give you a job? No, to take to my family. To adopt me, I thanked him very much you know, first I was afraid of course, you know, but afterwards, since my family suffered quite a lot from Germans and from Soviets, you know… My father was twice in prison, by Germans, afterward by Soviets. because he was… Your father was a Professor? my sister was arrested and even was in gulag, in the concentration camp. The Soviet concentration camp. So that she returned later in 1946 because my family, since my father was Professor of the Vilno University. He was [an] architect, but architect specialized in the representative buildings you know. For example he [designed] in Vilno the palace of the archbishop you know. And some churches and so on and it was just the Professor of architecture of interiors, you know, this is for example my father’s project. And this lamp in that, in the fore room, is also this. And this is my father’s design, you know, of the municipal palace in Vilno, it was according to his project, it was restored, because it was really, you know, [destroyed] by Russians. So it is a military academy…? … a lot of practice fighting in Europe. So he went there and taught the American army in George Washington – who never could pronounce his name properly – how to build fortifications, he was the hero of the Battle of Saratoga. Have you been on his tomb in the royal castle? No, I have… in Wawel Castle? In Wawel Castle. He’s in the cathedral. Also, the symbol of [Belarus], you know. Of Belarussia, as well, I didn’t know. The Belarusians consider him to be… He was born in Belarus. And on the gates of Moscow, in fact the last empire to successful occupy Moscow. Sometimes I tease Polish people that I say the United Kingdom where I’m from, and Poland have a shared history because we were both imperial powers. And I say and also we were victims of imperialism because we, the British, were conquered by the Romans, the Vikings and the French, just like you were conquered by the Soviets and the Austrians, and the Prussians, and the Germans. And of course there’s a slight difference in time scale. It doesn’t, it doesn’t… So anyway you came back to Poland in 1946? 1947, yes. Aha! And finally my brother who I considered him, which he doesn’t leave… that place of Poles is at the Vistula river, not outside, not in other country. And since my whole family, no matter of the persecutions, joined together until I was outside, you know. Therefore I decided to return. And I can say, and since my father had a good scientific position, it was recognized by their communist authorities, you know. Therefore I was not prosecuted. As many others.. So I think that it was just the father’s merit, you know, because of his great work, even for the Communist country because, you know, as an architect, it was not political work. Putting up buildings is for everyone. But very [indistinct] for the country, you know. And therefore I didn’t feel any persecution. Ok, and you became a Professor of geology, so also geology is not a political subject, is it? OK. Well I think that you know, if anyone listening to this is interested in more information about Professor Narębski or indeed the history of the bear. We will be posting links on the show notes, so that people can look up a bit more about this remarkable history and I would just like to close by thanking you very much for your time. All expense paid trip around the world, thanks to Stalin, right? He was joking, my father liked to joke. Well I was talking to you before the show and I’ve had the, we actually were serving… I served in a area in Iraq just where you were, which amazed me to hear that, the Polish army was in the exact same area seventy years ago that I was in Northern Iraq. And I traveled quite a bit in my life but most of it has been recreational, and you traveled quite a bit due to you know comrade Stalin and Churchill and all the people who sent you all over the world. But what have you learned from that or what perspective on life, looking back would you like to offer people? You’ve lived in a free country in the United Kingdom, then you lived in somewhat less free Poland, and then you’ve lived in free Poland again after the Communism fell. What have you learned from all that from your travels and just meeting so many people from all over the world? Well, the reason that I returned was just to… since all the family as I told you, despite all this persecutions, prisons, concentration camps, and so on, was met, was put together. Was joined together. And I was remained abroad, you know, and therefore since we were very good family I can say, very loving to each other, you know. So therefore I decided to return. That’s a great message I think to leave people with and to understand, you know… You’ve been everywhere and done everything and seen everything and had an amazing life at a very early age, and you decided to come back to a country that was having problems but it was to the family. Well, I knew that Poland is not free, completely free, but anyway you know… I could do as society you know, also contribute a little to improving of some.. of life in Poland we can say, improving the scientific position of Poland abroad, because I know rather well – not perfectly – English and Italian. I was sent off to abroad, to conferences, meetings scientific. And I could also present Polish science there, you know. I just remembered that we didn’t discuss your love of singing. I remember on one or two occasions you’ve reminded me that you know old British soldiers’ songs. You used to sing some songs. Ah yes it was very popular, Kiss Me Goodnight Sergeant Major. You have a disk with my songs? I have a disk with your songs, somewhere, but I was wondering whether maybe we could make the whole conference sing one of these old British war songs. We could teach them, you know maybe the White Cliffs of Dover, or Roll Out the Barrel, but Kiss Me Goodnight Sergeant Major – do you remember the tune how it goes? Do you remember how to sing, how to sing the song? Well you know I have problems with singing [singing a war song] “Kiss me goodnight, sergeant major …sergeant major, be a mother to me… Wake me nice and early in the morning; wake me up for a nice cup of tea”. It just came to me that this might be the most amazing experience of the TedX conference, if we could make the whole hall sing one of these old songs. I have in the computer, these songs. We could put the words on the screen and get everyone to sing. I think if we could do this, this would be a very memorable thing because these songs are not so well known. You told me that there’s a song called Bless Them All and you told me there was a different verse. Exactly and you told me there was a different version the soldiers sang that was less polite, right. Even British soldiers were singing the song. I know they were singing that a lot. I could imagine my soldiers were singing all kinds of stuff like that. So this gives me a possible idea but maybe our mission for the conference should be to make the audience of TedX Krakow sing one of these old songs. Of course Polish soldiers were singing, British soldiers were singing, people from all over the world were singing these songs because music brings people together, as well I think. well that’s just an amazing perspective and thank you for the stories and you know hearing, Iranian-Polish friendship stories and hearing stories of Soviet people and Polish people shared hardship under Stalin, who I think was hard on everyone who he came in touch… And them how you made the decision to come back to Poland. Really one of the things I just learned from it is, I think the listeners will get from this, is the power of optimism that you’ve projected all time working with Wojtek the bear and understanding that, as bad as it could get, it could always get worse. And it softens, makes life easier.. and of course. Yes, but the most important was just his presence, it is my opinion. And I think just to be present and project that attitude. I think he’s living through you because just from sitting here with you for an hour I can see that anyone who’s been in touch with you just leaves in a better mood. And I think that all of your students that you’ve taught over the years must have been be incredibly blessed to have had that influence in their life. And if you’re listening to this now, modern life is pretty tough sometimes, your iPhone, your battery goes down and other things, and especially, you know, in Poland today you see the kids you’ve grown up under the first twenty years of freedom that, they’ve seen I think it’s good for them to listen to, where you come from and think when it’s bad it’s never… Someones always had it worst and you could have a better attitude about it. Richard, you have this song from Żagań? You have recorded it? I’ve got it recorded yes. It’s very nice I think this song. And there’s more than one song so we have to check later which one we mean, because there are several Wojciech songs. I think this is the best. Meetings, you know… It is just my opinion. We have to be careful about our opinions. There is also a song by Scottish children. Yes I played that song in my TedX talk because it’s very funny that the Scottish children… because there’s a myth in Poland, a kind of belief that everyone knows foreigners don’t know Polish history. Every Polish person is convinced that foreigners know nothing about Poland and if I played them this song of Scottish school children singing about Wojtek the bear, in their Scottish accent, it’s very funny because quite often Polish people don’t know this history so well. And it’s very funny to see their reaction. Probably most funny were this visit of Russians children of Polish origin…you participated in it? Yes I have clip of it on youtube. What part of Russia is that? “How you have written this?” They get piece of paper and you know and the Polish words was written in Cyryllic, in the Russian alphabet, you know. And we actually meet these children in the park by the statue of the bear. The weather was very bad. If anyones interested I have this group on Facebook, the Wojtek the soldier bear group on Facebook, which has more than two thousand members all over the world and any event like this I take some photos, because the wonderful thing about the Internet, as this podcast shows, is that you can distribute information about any subject, for the whole of the world for free, thanks to this wonderful technology, including photographs of Professor Narębski and middle aged Richard and young Russian children from Polish extraction, singing a song in Polish in a Russian accent in front of the statue of the bear in Poland. Quite a remarkable world we live in. So I think that’s a very good way to end. Well thank you again, Wojtek, for sharing with us your lessons on life. All the pleasure in mine. And all the problems with throat, also. Look, your singing voice is still fantastic and I can’t wait to see you lead some songs at TedxKazimierz and thank you again Richard for organizing this great interview and just a chance for myself and everyone listening to this to explore some of the rich history of Poland, and this part of the world. And also just some of the cool legends that live here in Krakow, specifically with the statue of Wojtek the bear. And thank you again Project Kazimierz listener for another episode of Project Kazimierz. I’d like to remind you if you’re interested to go to the TedX Kazimierz website and check out the previews of the coming speakers, who Wojciech will be one of them and also any other news and events as well as that. Or you can also find show notes for the show at Project Kazimierz website and we will definitely keep you updated on anymore happenstances of Wojtek the bear from the show page, so thanks again for listening and we’ll see you next time.